Thanks to Comfort & Harmony, the makers of Mombo, she is now finding insta-cozy positions for her and baby. We received the Deluxe Mombo Pillow and Slipcover with soothing removable vibrations. This is seriously the best nursing pillow I have ever seen. It has a soft side for lounging and a firm side for feeding. The vibrations are great for when he is fussy. It is like it makes him instantly forget what he was upset about! For feeding time, simply flip the Mombo pillow to the firm side and prop baby up to your breast. It is that easy… No more straining to hold the proper positions. And when on the floor, you can use the soft side for propping baby up (helps with calm acid reflux), tummy time and sitting up. One of my favorite features of the Mombo Nursing Pillow is the removable, machine washable slipcover. The zipper is neatly tucked away so baby is never scratched or irritated by rough spots and the cover comes off with ease. Babies are always making messes so wash-ability is key in my book. Plus, I like to be able to disinfect EVERYTHING baby comes in contact with. Checkout all the Mombo products available at Toys R Us and Babies R Us. Be sure to like Comfort & Harmony on Facebook and follow Comfort & Harmony on Twitter too! I have a new baby boy on the way- and would love to use this myself! my bff is expecting next month and i am trying to helping out with baby things. I would love to have this for myself since my husband and I are ttc. for one of my nieces. I would love to win this for myself as I have a newborn! I’d love to win for myself, we’re trying for #2 now. I’d love one for me… my son is a big baby and we dont have a nursing pillow… i think it would make life more comfortable! i’d like to win this for my niece! This would be given to my sister! This would be a great shower gift! This looks like an excellent product – love the hidden zipper designed to protect baby’s skin. A good friend is expecting her first and I would LOVE to give this to her. Thanks for the great post and info! I’m pregnant with my first and would keep this. I would like to win this for myself. New baby will be here any day. Thanks! I want it for a friend! Thank you for the chance to win! I want a mombo because we’re expecting our first! my neighbor is due any day now and she could really use this! my sister is having twins so she’ll need all the help she can get – i’d give it to her! I would love to win this for my best friend who is finally expecting her first baby in August! I’d like to gift this to my daughter. I would like to Win this to give it to my sister, for her and her new born. It will be for my sister in law she just had a baby girl! For my Sister in law, who is expecting! I would love to win this nursing pillow for myself. I thought I was done having babies so I gave all my stuff away, then I was surprised with another miracle. Having a nursing pillow is a must! Would like to give this to a friend that has twins and has her hands full. My husband’s coworker at the fire station is a young man who married recently. His wife just found out they are pregnant, and they don’t have a lot of money…. this would be a super gift for them!!!! My sister is expecting her first baby in July. This would be great for her. i would love to win this for me, I have heard alot of great things! My baby sister is having her first baby new month! We loved our off brand nursing pillow, but this looks better. Maybe I’d even make he give it back for our next! I want to win it for my Little sister. She is having her 1st baby in october. I would like this pillow for my daughter. I want one for my sister because it will be her first baby! I’d love to win one for my wife to use with our seven week old daughter. It would be great for both of them! I would gift this to a friend who is due in December! My first is having her first baby! This would be for me. We’re having a baby in August. I nursed by first until 17 months so this would be really helpful. I have a friend expecting and this would make a great shower gift! My son and daughter in law just found out that theyre expecting. It would be for them. 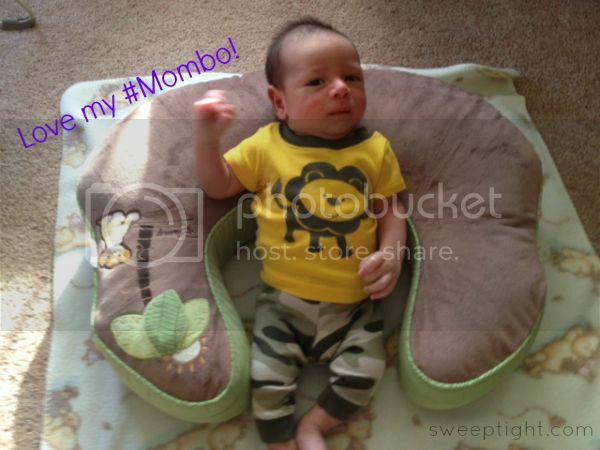 My son & his wife are expecting and could really benefit from the Mombo nursing pillow! I have a friend that is about to have her baby. This would be great for her! It would be for my wife. She is pregnant with our first child. I would like this for a loved one who is intending on breastfeeding and is a first time mommy so she’s really nervous, id love to give her this to help and also encourage her! This would be great for my friend and her new baby! A friend of my mother just had a new born baby and I know she will just adore this! this will be for my wonderful daughter in law who is due in June with our 2nd grandson…can’t wait! I want it for a friend. I would love to win this for my sister in law who just recently found out she is expecting… TWINS! I would give this to my sister, who is due in June! I’m a doula – I’d give it to a client! I would give this to my sister who is expecting. This would be for my daughter. She just had my granddaughter last week. I would like this win this for myself as I’m due in September. I want a mombo because it would be perfect for my friend!